Leamington manager Paul Holleran says trialist winger Chekaine Steele is going the right way about earning a prolonged stay at the Phillips 66 Community Stadium. The 21-year-old is coming off the back of an injury-plagued season but after seeing him score for Brakes in their 2-0 win at Racing Club Warwick on Tuesday evening, Holleran is hoping the winger can get back to the form which persuaded AFC Telford to sign him from Worcester City last summer. “He’s had a couple of injuries and last season was a disastrous one for him but he’s got something,” said Holleran of the former Port Vale youngster who ended the last campaign at Sutton Coldfield Town. “I watched him for Worcester against Telford in the FA Cup (in 2016) and he was the best player on the pitch. “Last year was a year to forget for him but he’s two-footed, strong and can go both ways. “It was a no-brainer to get him in. 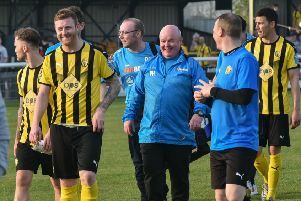 Steele’s 84th-minute penalty sealed a 2-0 win for Brakes in the annual charity game and Holleran said the work that had gone into making the bone-hard pitch playable was well rewarded. “It was a really good game considering the conditions. “There were glimpses of quality from both sides and it was a very competitive game. “You can see Racing Club are improving year on year and there are in a better place now than they were a year ago. “I’m sure they’ll go pretty close this season. Brakes this week confirmed that Joe Magunda and Shay Nicholson will again be part of the squad for the 2018/19 campaign. However, Richard Taundry has left the club as he looks for a side closer to his Walsall home. “It goes without saying that Richard has been a fantastic signing for this football club,” said Holleran. Brakes are back in action tomorrow when they entertain Derby County as part of a Community Day.